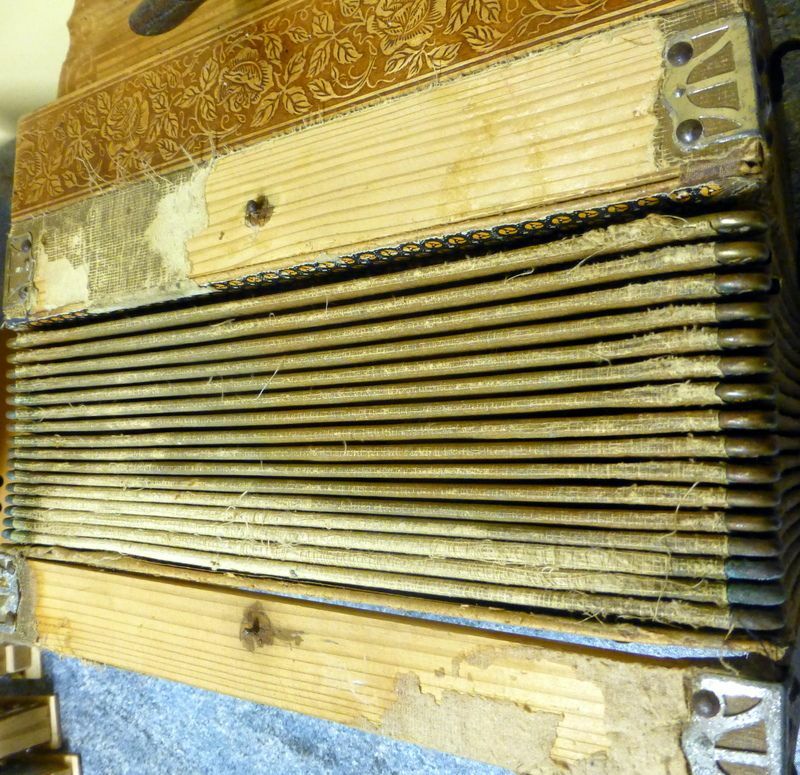 I guess mine may be a little later then, as the pattern on the woodwork is different, and perhaps more Hohner-ish. Same damage to the fingerboard - though the repair s a pretty straightforward job. Yes psuggmog, it's exactly the same but minus the grill. It's not a bad box at all but does need some work. Which I'll get sorted. Might be able to find a grille if you want. Rusty but not bad. Sounds good to me Malcolm. may be somebody owns Koch simile to this No. 8068 in catalogue but larger? I have Koch like this but 12,5 inches instead 11" in catalogue. Unfortunately it is without original grill. I have idea to make copy of the grill using laser cutting, so i am looking for HQ photos of the grill. Well, it's a 1930s pressed wood G/C box with wide bellows frames. 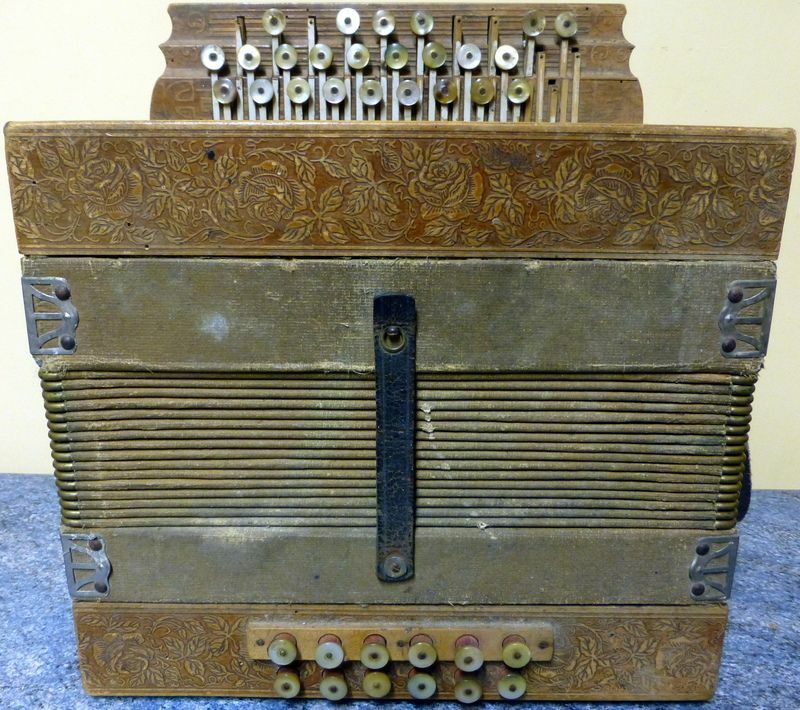 The case says Koch, it has a metal action and Hohner air button, so presumably shortly after Koch got taken over. The picture in the catalog page seem to be two rows. Malcolm's is three rows. Does that explain the size difference? The one that I had was two row. I can't remember if it had a grille, don't think it did, but the standard 2915 grille pre-war grille fitted perfectly (so I expect a modern one would, too). I did start to look at making a pattern for laser cutting, but I don't have photographic equipment or skills. I tried getting a photocopy into a graphics program, but it was a major job cleaning it up and the original I had was slightly dished and caused some distortion, so I eventually lost interest. It would be possible to do something very similar in a vector drawing program, but again time consuming. I used the photocopy as a background in Visio, enough for a proof of concept, but didn't take it further. Surely it would be easier to cut a new grill with a fretsaw? The pattern that I've seen on these is fairly simple and a fret cut grill would look more authentic. Sorry, I wasn't clear, it was the metal one we were trying to copy. At the time I was in a conversation with NickF about laser cutting and fancied getting the same appearance in a wooden replacement grille. The metal grills I've seen on those have been identical to the older style Hohner grill. 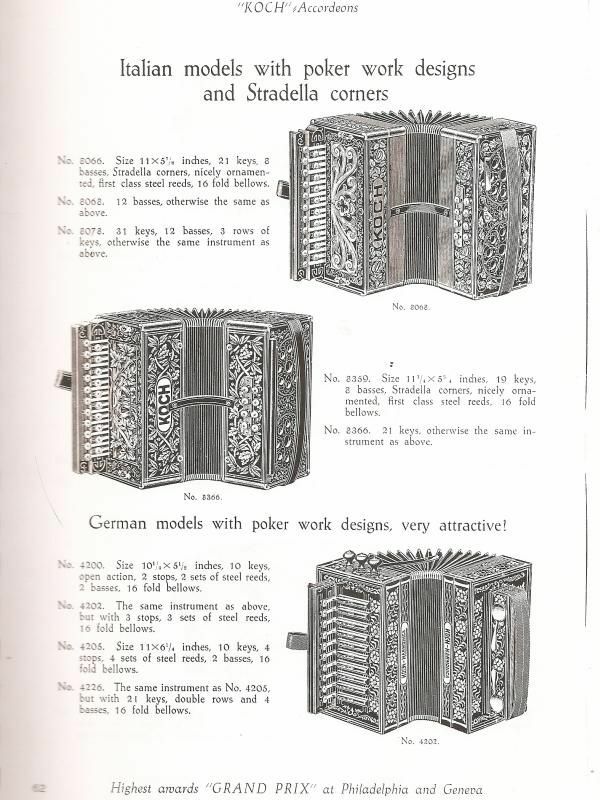 This Koch is exactly the same design like in catalog, two rows, 12 basses, but larger. May be because three voices (nothing about voices in catalog). If to find 11 inch wooden grill from model with roses, may be i can scale photo to required size. Also i hope i can convert photo into corel graphic. Koch with roses, metal grill and Hohner's keyboard pad (and grills there: http://www.ebay.de/itm/182299136933 ) it seems are made by Hohner when original Koch parts finished. I am not very interesting in them.